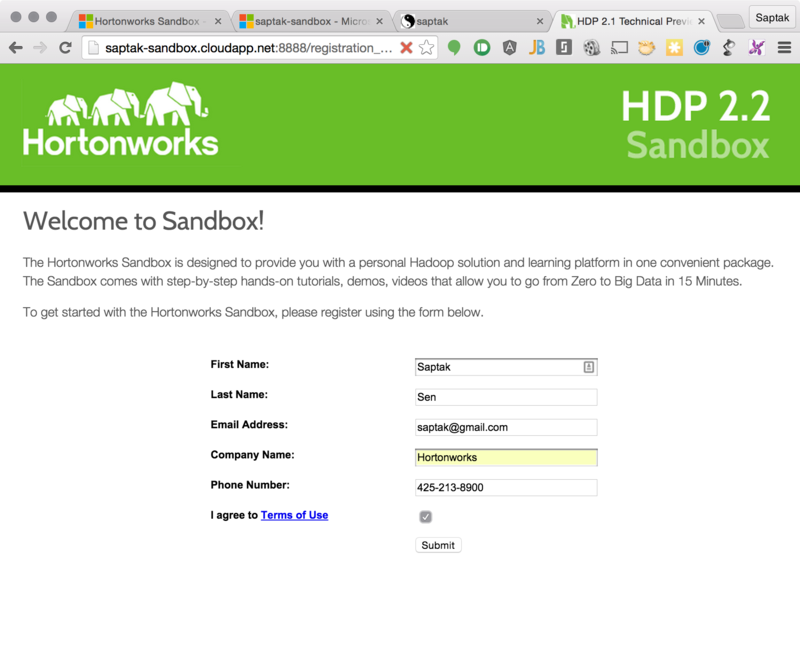 We are excited to announce the general availability of Hortonworks Sandbox on Microsoft Azure. Hortonworks Sandbox is already a very popular environment for Developers, Data Scientists and Administrators to learn and experiment with the latest innovations in Hortonworks Data Platform. The hundreds of innovations span Hadoop, Kafka, Storm, Hive, Pig, YARN, Ambari, Falcon, Ranger and other components that HDP is comprised of. We also provide tutorials to help you get a jumpstart on how to use HDP to implement a Modern Data Architecture at your organization. Every component is updated including some of the key technologies we added in HDP 2.2. 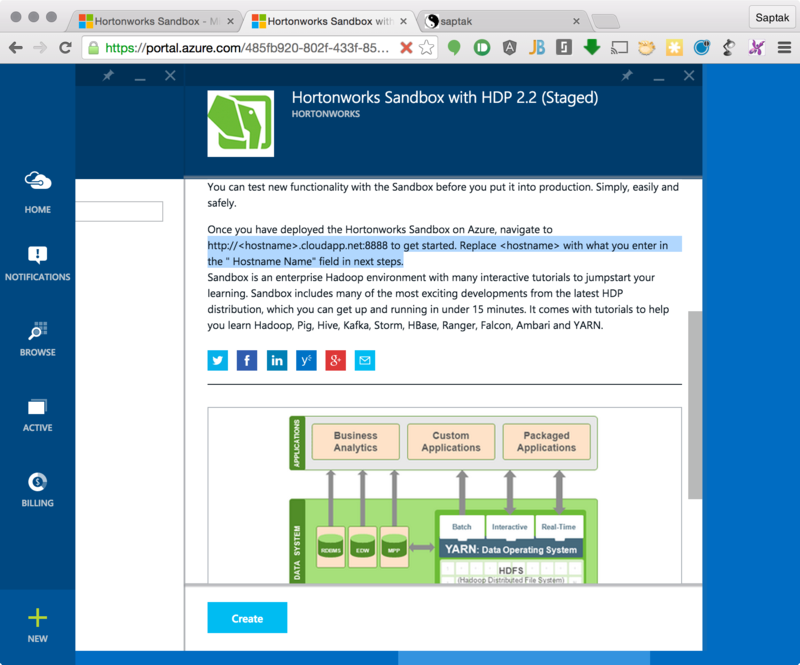 This guide walks you through using the Azure Gallery to quickly deploy Hortonworks Sandbox on Microsoft Azure. 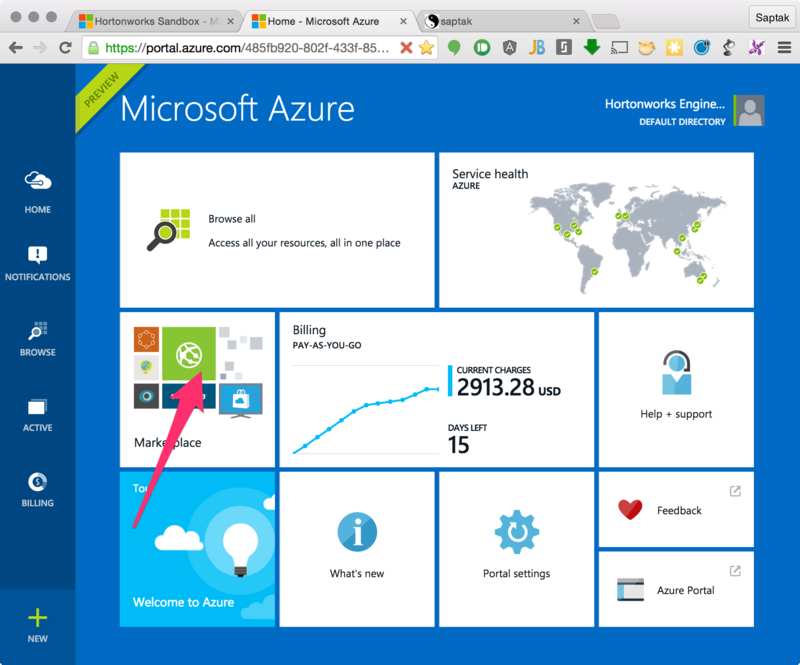 A Microsoft Azure account – you can sign up for an evaluation account if you do not already have one. Search for Hortonworks. 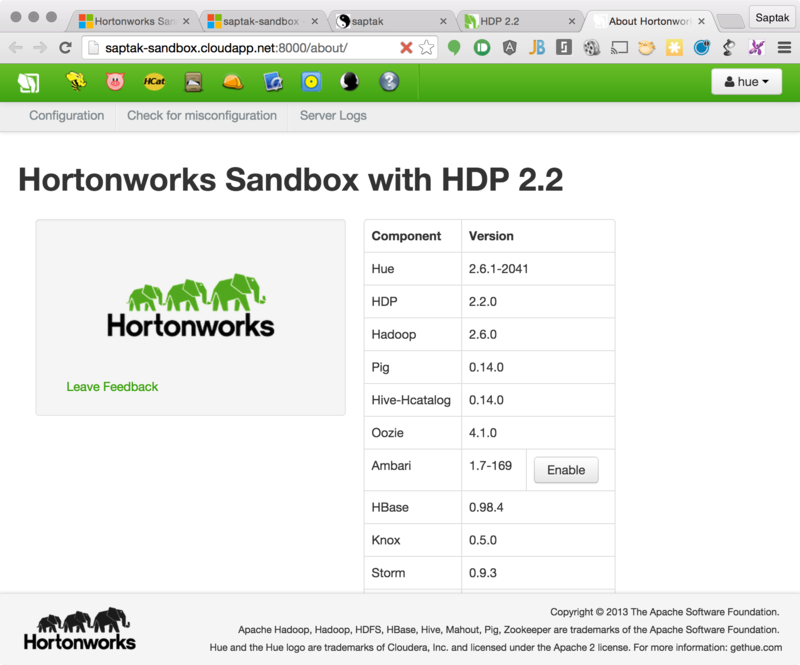 Click on the Hortonworks Sandbox icon. This will launch the wizard to configure Hortonworks Sandbox for deployment. Note the highlighted text in the instructions above. You will need to note down the hostname and the username/password that you enter in the next steps to be able to access the Hortonworks Sandbox once deployed. You can change these configurations if you want, but the defaults work well. 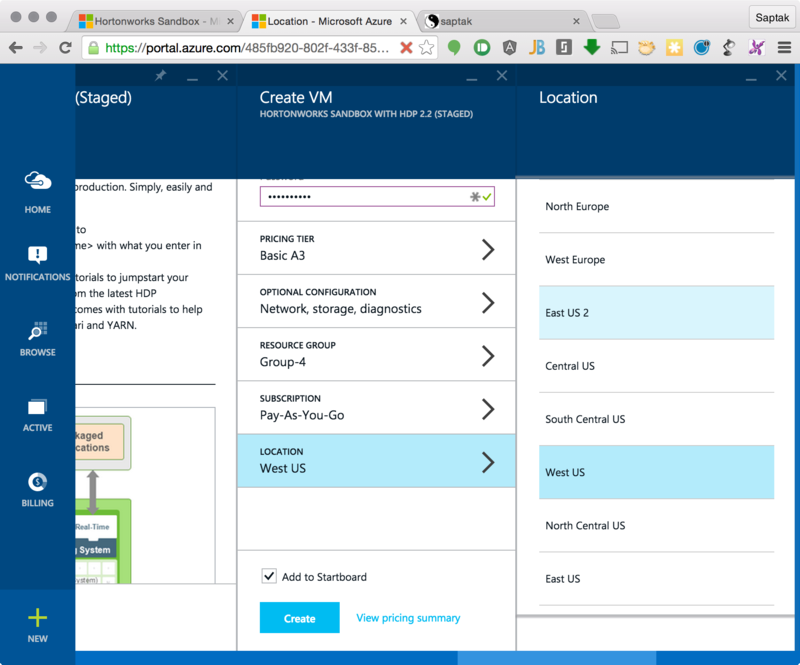 I usually change the location to the datacenter to where my preexisting Azure resources are or the one closest to me. Click Buy if you agree with everything on this page. 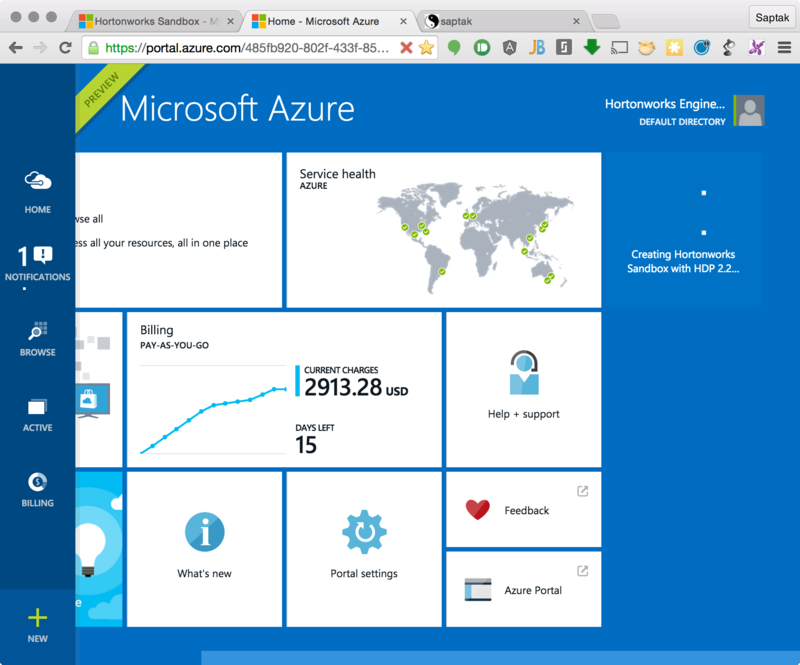 At this point it should take you back to the Azure portal home page where you can see the deployment in progress. Once the deployment completes you will see this page with configuration and status of you VM. Again it is important to note down the DNS name of your VM which you will use in the next steps. If you scroll down you can see the Estimated spend and other metrics for your VM. Let’s navigate to the home page of your Sandbox by pointing your browser to the URL: http://<hostname>.cloudapp.net:8888 , where <hostname> is the hostname you entered during configuration. If you are doing it for the first time, it will take you to the registration page. Once you register, you will see the homepage of your Sandbox. 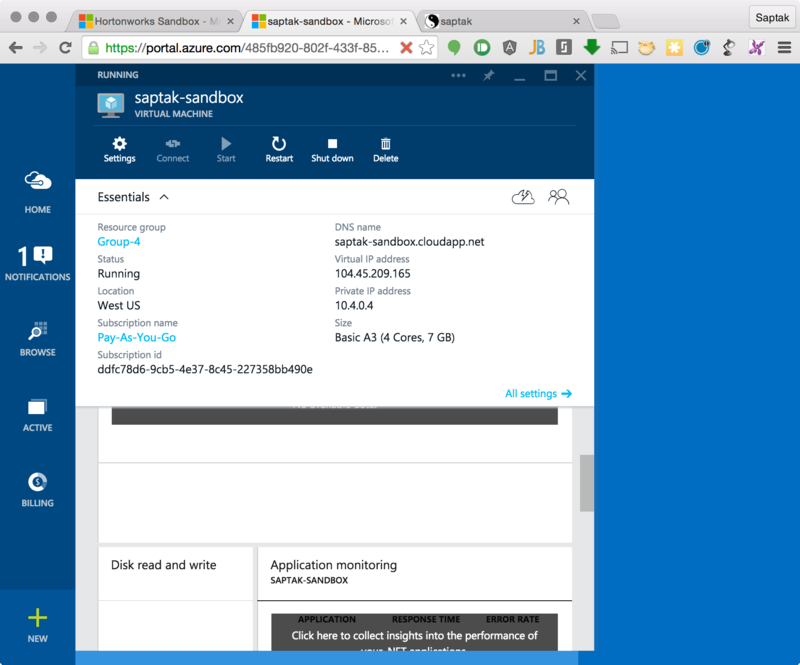 By, navigating to port 8000 of your Hortonworks Sandbox on Azure you can access the Hue interface for your Sandbox. Enable Ambari by clicking on the Enable button. Ambari is crucial for managing your HDP instance. 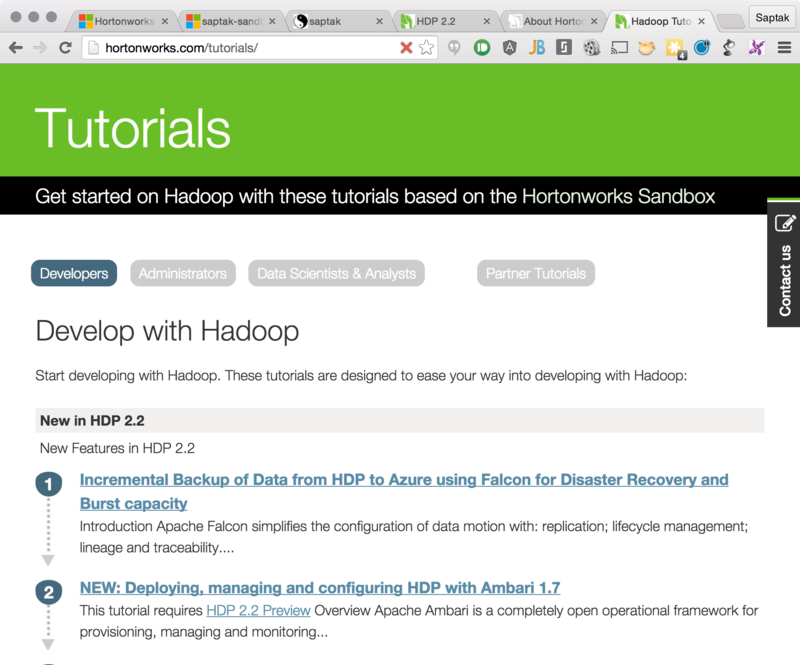 If you want a full list of tutorial that you can use with your newly minted Hortonworks Sandbox on Azure go to https://hortonworks.com/tutorials. 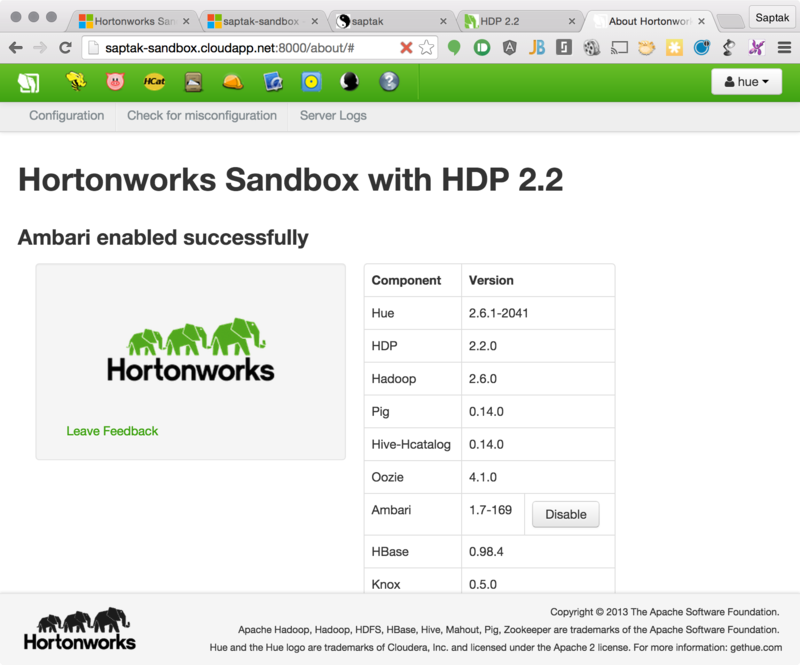 Happy Hadooping with Hortonworks Sandbox! It seems that deploying the sandbox on Azure will always need a credit card information, right? However, there are several cases that there is no credit card linked with my Azure subscription so i cannot provision HDP sandbox on Azure…. 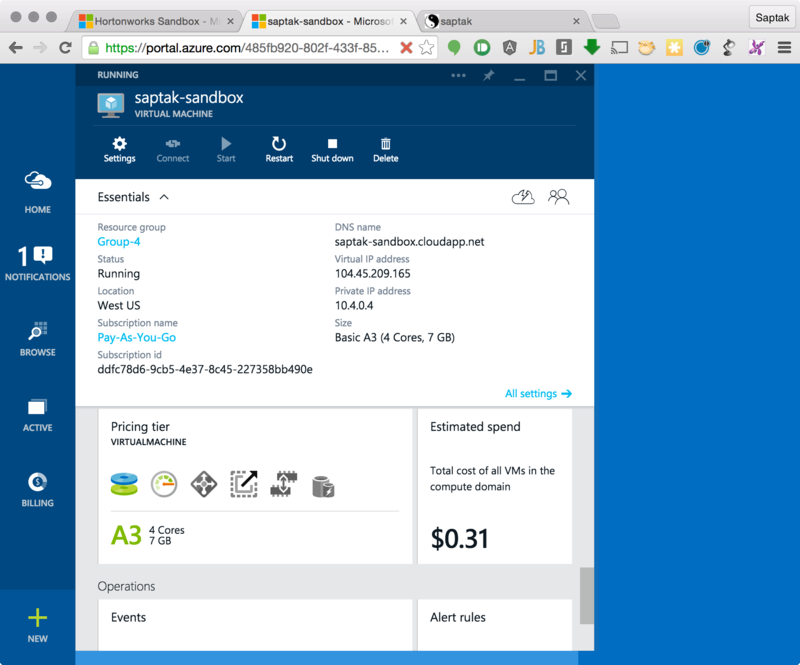 Does anyone know how much costs keeping this sandbox on Azure platform for, let’s say, a month? This is just a test comment. 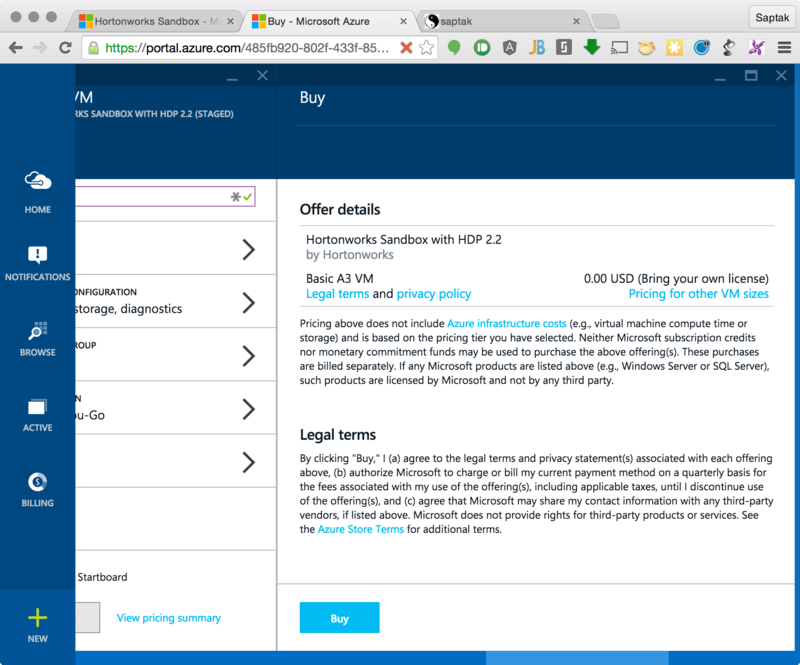 I really like HDP on Azure. I’m wondering how well it works. Very Nice tutorial for beginners. I attended a workshop at Microsoft Reading and followed along this tutorial to get Hadoop up and running on Windows Azure Platform and it works superbly. I used Ambari Dashboard to configure HDFS, Mapreduce, YARN (which is a scheduler), Tez, Beeswax Hive (SQL Query Editor) , HBase, Pig, HCatalog, File Browser, Job Browser, Job Designer, Sqoop, Oozie, ZooKeeper, Falcon, Slider, Storm and Flume. Please share the Azure credits which will be consumed on usage of this VM. Thank you!! I get access denied error when connecting via SSH (username: root password: hadoop). However it works with user provided during virtual machine configuration. I tried to exectue Hive saved queries. I get this error Permission denied: user [hue] does not have [USE] privilege on [default]. Any help? 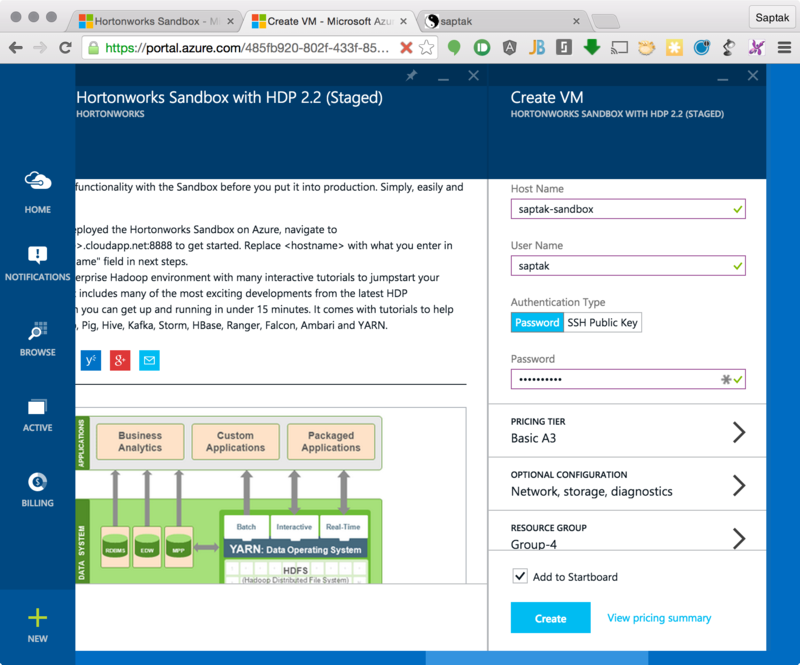 After following the tutorial, i am able to start the Hortonworks sandbox on Azure. I want to add apache kafka on the Hue interface. Is there any way to add that? How do I open Shell Command prompt from Azure HDP? You have to ssh via tool called putty. In putty you have to give your .cloudapp.net and with port number that is in the Endpoints section in VM Dashboard(in azure portal)(pick the public port number of SSH). you can login using the username and password given during the time when you registered your VM in azure. I am unable to ssh to root on my azure sandbox, can someone tell me the default password for root, I tried ‘hadoop’ as password, but it is not working. Has anyone been able to successfully ssh to azure sandbox. My connections attempts keep timing out. The install instructions don’t say this but do we need to create an SSH Key? Specifically don’t add a port number to the end. Then you should be gtg. Hope this saves someone else 1 hours of messing about. I have the same issue, I followed this tutorial, when I enter my sandbox url in the browser, it gives me a time out error. How did you fix it? i use the free trail of azure and entire my credit card information and sing in i received a notification that i have no subscription i dont now way ?? 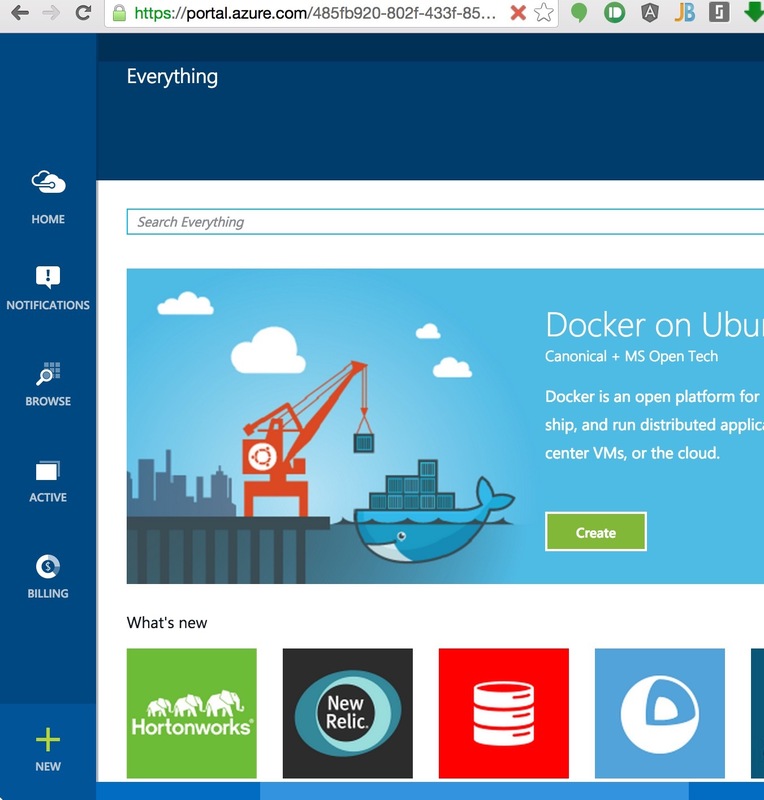 i wont to start with this tutorial but i dont know how can i can i start with azure ist free ? 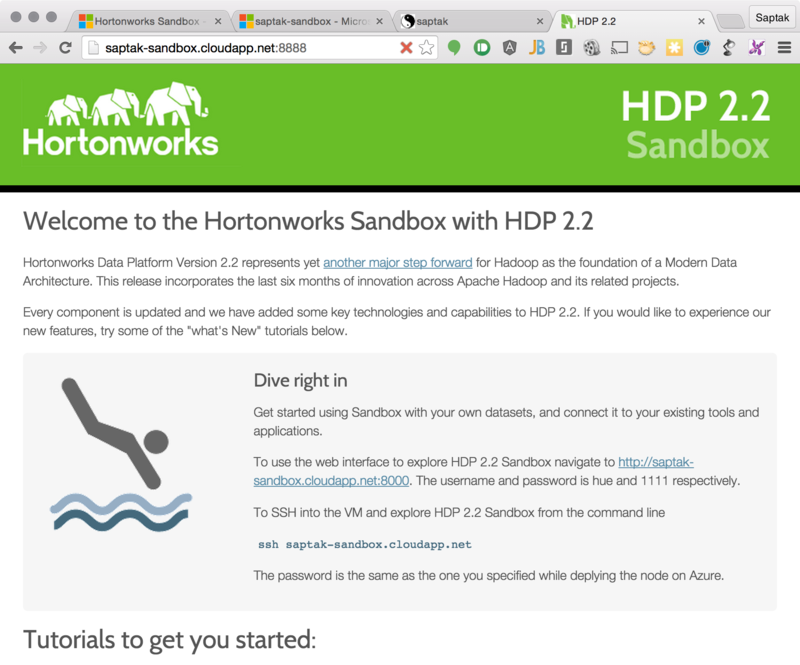 I have got a MS azure free subscription and configured Horton sandbox. I could not see anything related to billing. Will there be any charge. To login As root in sandbox deployed on azure Do login as registered user first then type this :- sudo su – root. it worked for me. 1. 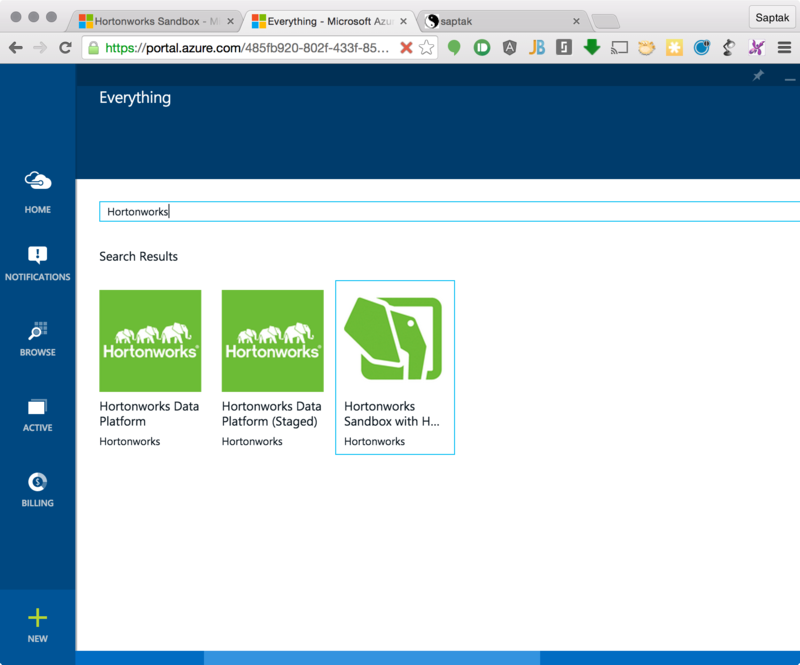 Deploy Hortonworks-Sandbox on Azure from MarketPlace. 2. I then use the browser to http://hostname:4200 and is able to see the sandbox login: screen, but it keeps return me to enter password event I use the right username/password when I created the Hortonworks. 3. I then use the same username/password by Putty to SSH works! Please advice me how to login to the sandbox by browser, thanks. i’ve recently installed the hortonworks sndbox on Azure, and i’m facing the same problem while trying to access sandbox with my browser chrome (OS Linux). i have follow the process of opening port in azure ( https://docs.microsoft.com/en-us/azure/virtual-machines/virtual-machines-windows-nsg-quickstart-portal ), but i’m still having time out error message. can you please help me to figure out what is going wrong on my installation?